Under The Bridge presents... Non Canon!Non Canon returns to Manchester for an intimate unplugged show in the lounge at Gullivers. 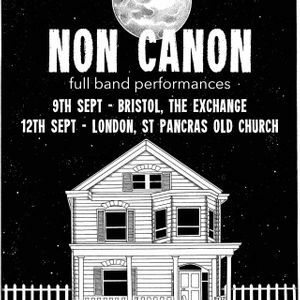 The latest musical project from Barry Dolan, Non Canon is more laid-back, contemplative, indie-folk than the much heavier Oxygen Thief.Support comes from Warren Mallia (Grand Pop / The Attika State) and Annie.Doors - 7:30pm£6 advance / £8 OTD--Non Canon - https://www.noncanon.co.uk/Non Canon is a series of cleverly written and beautifully played musical vignettes from the man behind Oxygen Thief. Laid-back and contemplative, Non Canon's indie folk sound presents you with something familiar, but entirely different at the same time. His self-titled album was released via Xtra Mile Recordings in 2016 and we urge you to check it out - all of the song titles are based on famous non-canonical works.Warren Mallia - https://grandpop.bandcamp.com // https://theattikastate.bandcamp.com/Frontman of The Attika State and now Grand Pop, Warren Mallia making a rare appearance in Manchester is something to be excited about. Owner of one of the finest voices in all of music and an incredible songwriter, you don't want to miss him.Annie - https://soundcloud.com/anniesmusicplaceAnnie makes acoustic indie-pop with bite. Drawing influence from everyone from Sheryl Crowe to Sunny Day Real Estate and Idlewild, her sound is awesomely eclectic. Annie can also be found fronting Manchester shoegaze types Simmer.